joy magnetism: What's for dinner? I picked this K-ration magnet up at the Brooklyn Museum for 92 cents! I don't even remember the last time I saw any magnet (or anything, really) on sale anywhere for less than a dollar! So of course, I picked it up. And you know I had to stop myself from picking up the Breakfast and Lunch magnets, too. They were supercute, but I didn't think I could field two additional magnetposts for them. Not really, anyway. How cool is this magnet, though? I love that it explains right on the box what's included for the meal. There is something really funny about the government repackaging the rations boxes with something they called the "Morale Series," where each meal was color- and letter-coded. As if making the meals pretty on the outside were going to make it more palatable to the men. K rations were introduced to our troops in 1942, right in the middle of World War II. They were supposed to be emergency rations only, but as the war wore on, it was increasingly used as their main staples. I mean, just look at the contents - all that sugar! But, apparently, they went through all this rigorous field testing with each set of rations to see if they would be sufficient for the troops. The poor guys got tired of eating the same rations day in, and day out, and truth be told, the rations weren't even really enough to keep them moving, because their calorie content were somewhat less calories than what active men need. 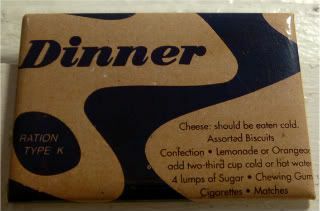 By the end of the war, the army moved on to the new and improved C Rations, leaving millions and millions of surplus of K rations to feed the hungry overseas. Can we watch Doctor Who?